New ultraviolet images from NASA's Galaxy Evolution Explorer shows a speeding star that is leaving an enormous trail of "seeds" for new solar systems. The star, named Mira (pronounced my-rah) after the latin word for "wonderful," is shedding material that will be recycled into new stars, planets and possibly even life as it hurls through our galaxy. In figure 1, the upper panel shows Mira's full, comet-like tail as seen only in shorter, or "far" ultraviolet wavelengths, while the lower panel is a combined view showing both far and longer, or "near" ultraviolet wavelengths. The close-up picture at bottom gives a better look at Mira itself, which appears as a pinkish dot, and is moving from left to right in this view. Shed material appears in light blue. The dots in the picture are stars and distant galaxies. The large blue dot on the left side of the upper panel, and the large yellow dot in the lower panel, are both stars that are closer to us than Mira. 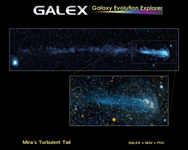 The Galaxy Evolution Explorer discovered the strange tail during part of its routine survey of the entire sky at ultraviolet wavelengths. When astronomers first saw the picture, they were shocked because Mira has been studied for over 400 years yet nothing like this has ever been documented before. 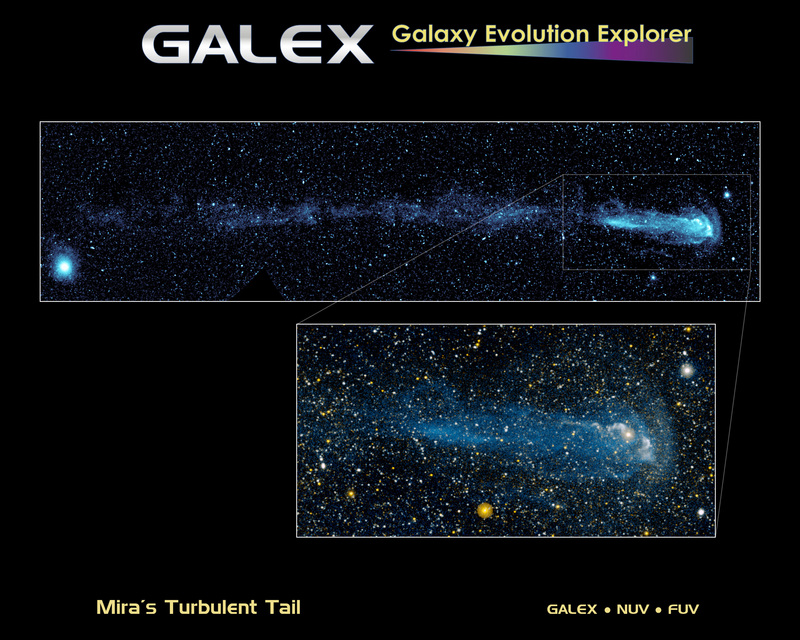 Mira's comet-like tail stretches a startling 13 light-years across the sky. For comparison, the nearest star to our sun, Proxima Centauri, is only about 4 light-years away. 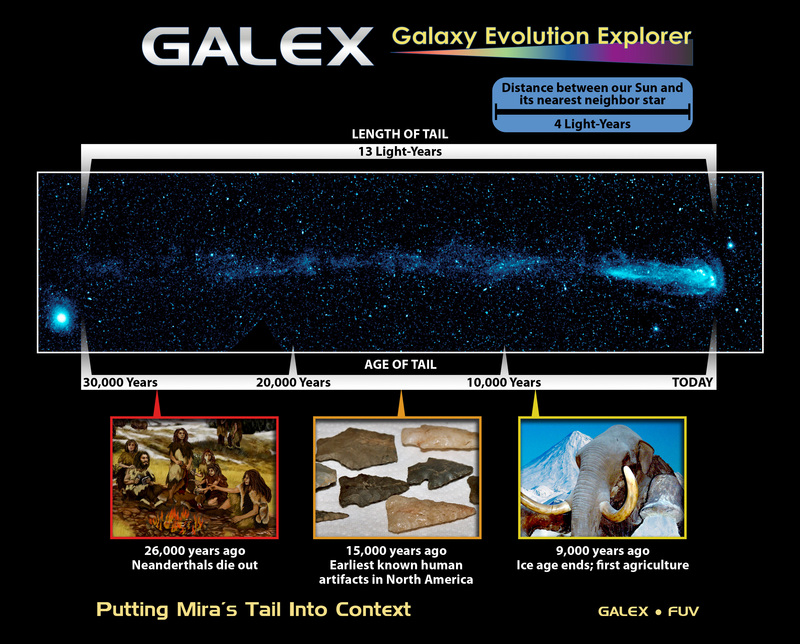 Mira's tail also tells a tale of its history -- the material making it up has been slowly blown off over time, with the oldest material at the end of the tail being released about 30,000 years ago (figure 2). Mira is a highly evolved, "red giant" star near the end of its life. Technically, it is called an asymptotic giant branch star. It is red in color and bloated; for example, if a red giant were to replace our sun, it would engulf everything out to the orbit of Mars. Our sun will mature into a red giant in about 5 billion years. Like other red giants, Mira will lose a large fraction of its mass in the form of gas and dust. In fact, Mira ejects the equivalent of the Earth's mass every 10 years. It has released enough material over the past 30,000 years to seed at least 3,000 Earth-sized planets or 9 Jupiter-sized ones. While most stars travel along together around the disk of our Milky Way, Mira is charging through it. Because Mira is not moving with the "pack," it is moving much faster relative to the ambient gas in our section of the Milky Way. It is zipping along at 130 kilometers per second, or 291,000 miles per hour, relative to this gas. Mira's breakneck speed together with its outflow of material are responsible for its unique glowing tail. Images from the Galaxy Evolution Explorer show a large build-up of gas, or bow shock, in front of the star, similar to water piling up in front of a speeding boat. Scientists now know that hot gas in this bow shock mixes with the cooler, hydrogen gas being shed from Mira, causing it to heat up as it swirls back into a turbulent wake. 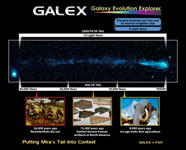 As the hydrogen gas loses energy, it fluoresces with ultraviolet light, which the Galaxy Evolution Explorer can detect. Mira, also known as Mira A, is not alone in its travels through space. It has a distant companion star called Mira B that is thought to be the burnt-out, dead core of a star, called a white dwarf. Mira A and B circle around each other slowly, making one orbit about every 500 years. Astronomers believe that Mira B has no effect on Mira's tail. Mira is also what's called a pulsating variable star. It dims and brightens by a factor of 1,500 every 332 days, and will become bright enough to see with the naked eye in mid-November 2007. Because it was the first variable star with a regular period ever discovered, other stars of this type are often referred to as "Miras." These images were between November 18 and December 15, 2006.